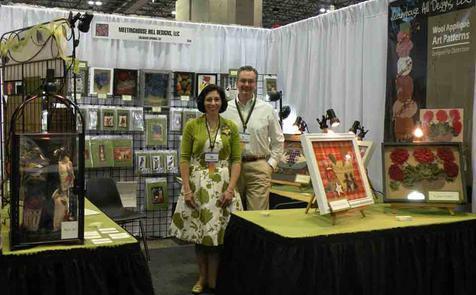 Allow me to share with you a brief history of Meetinghouse Hill Designs, LLC. I began this business in January of 2007, with rough sketches and penciled notes of images I could see in my head, and thought would translate well into wool. 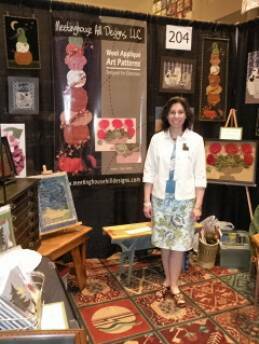 I had always worked in the textile world whether it was custom sewing garments, teaching quilt making or restoring antique quilts. 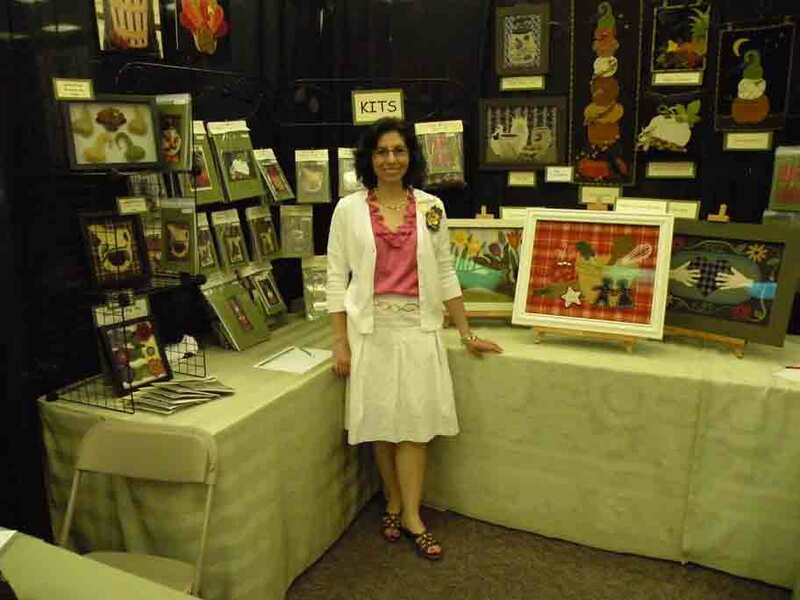 I have enjoyed a wide variety of arts and crafts throughout the years (like cross stitching, rug hooking, quilting, sewing clothing and home décor, painting... you know how the list goes on and on!) 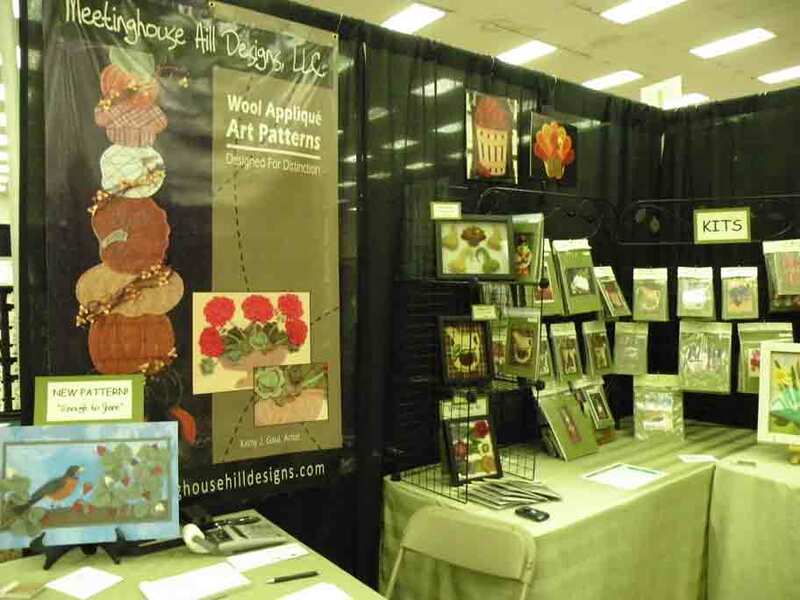 Throughout most of 2008 I drew and stitched many of the designs that are featured on this website. In that late summer some of my finished artwork was introduced to a folk art gallery owner from Osterville, Massachusetts. 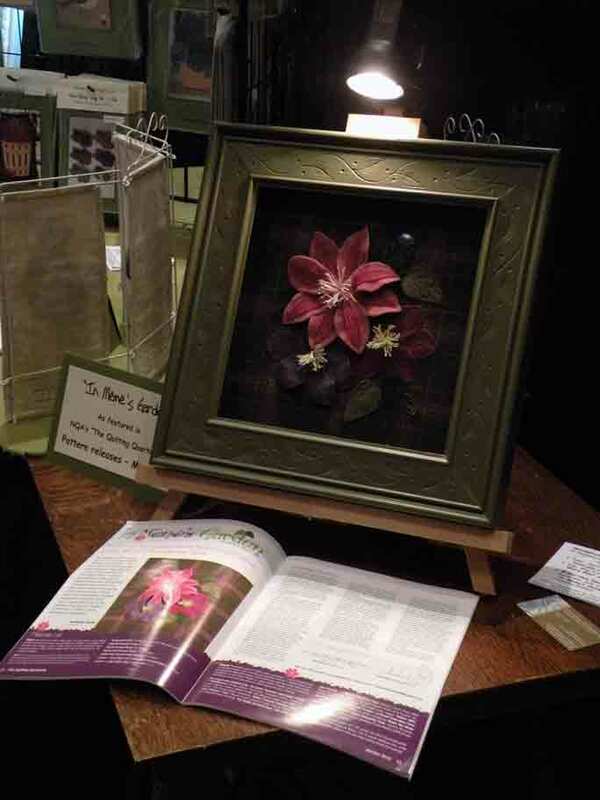 Kindred’s Antiques and Folk Art (www.kindredsantiquesandfolkart.com) began carrying my work in the fall, and continues to show art pieces from time to time. 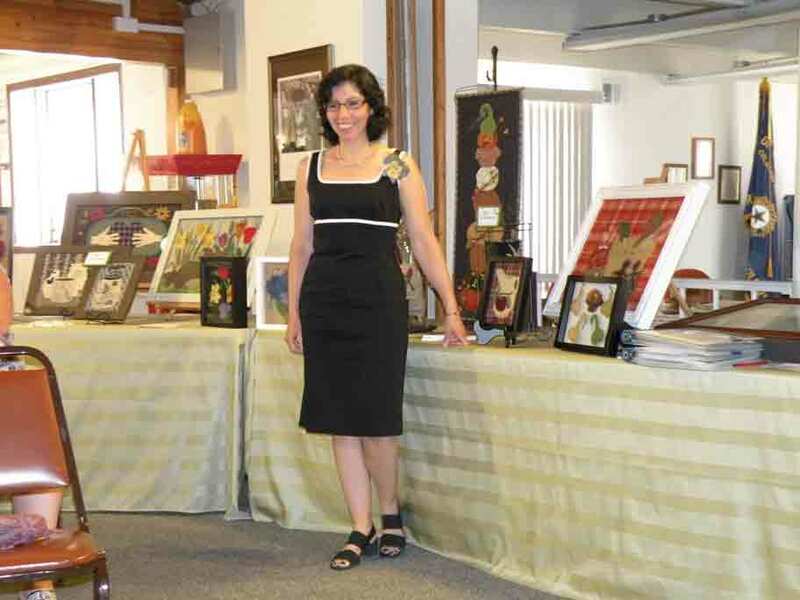 This gallery has a spectacular mix of truly American made folk art, with everything from paintings, carvings, textiles, paper art, and even shell art! It is a privilege to have my art displayed along with such amazingly gifted and talented people. At the beginning of 2009 I decided to return to my initial desire which was to develop patterns for my wool appliqué art. After four months of drawing, writing, editing, printing and packaging I launched my new patterns in late April, and it has been an awesome experience ever since! I have received kind and very positive feedback to my designs and patterns, and I am humbled by that. I hope as you review my art, you will be pleasantly surprised by the uniqueness of the designs, and the detail that I put into each. 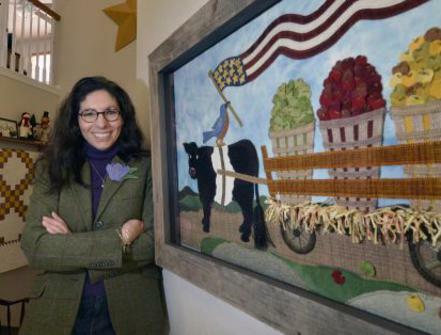 My tag line, “Wool Appliqué Art Designed for Distinction,” really defines the way I think, that this handcraft is truly an art form that stands out from the rest! And, it is one that I desire all skill levels of artisans to attempt their hand at, and journey through to having a completed piece that they are inspired and delighted with! Each pattern that I publish includes a set of very detailed instructions, a full scale drawing of the design as well as individually drawn pattern pieces, a page of instructions for felting wool fabric, a page of hand drawn images of all stitches used in my patterns, and a complete supplies list. The pattern cover also has a very clear photograph of the finished piece. Each pattern is copyright protected, and all inquiries regarding copying patterns, kitting, selling of finished artwork and other such protected ideas may be directed to me at [email protected]. New England towns were built around “commons” – grassy areas usually centrally located – surrounded with buildings and at least one “meetinghouse.” The meetinghouse was often used both as a place of worship and a place of social gathering for the community. 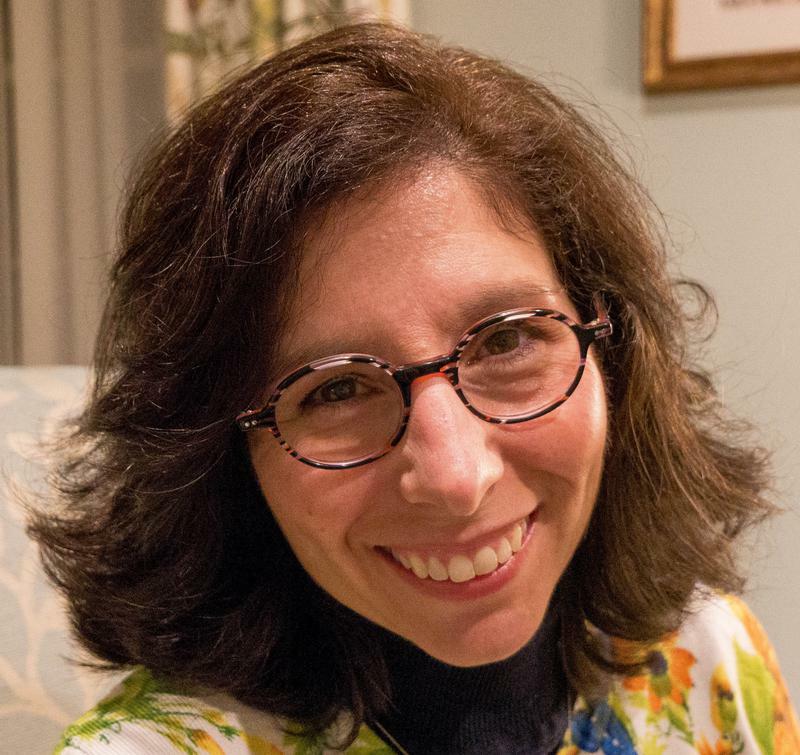 My husband Jerry and I were married in a meetinghouse, which just happens to be located on Meetinghouse Hill Road! My desire with this business is to stand firm on the solid ground of my faith and family, to do business right, to gather people together through the arts and to express the gift of creativity that has been given to me by an amazing Creator. I am blessed to travel back to New England often, first to see my family, and second to drink in the sights and sounds, the smells and tastes that feed my soul, and its expression – my art! I hope you are amazingly pleased with my designs! 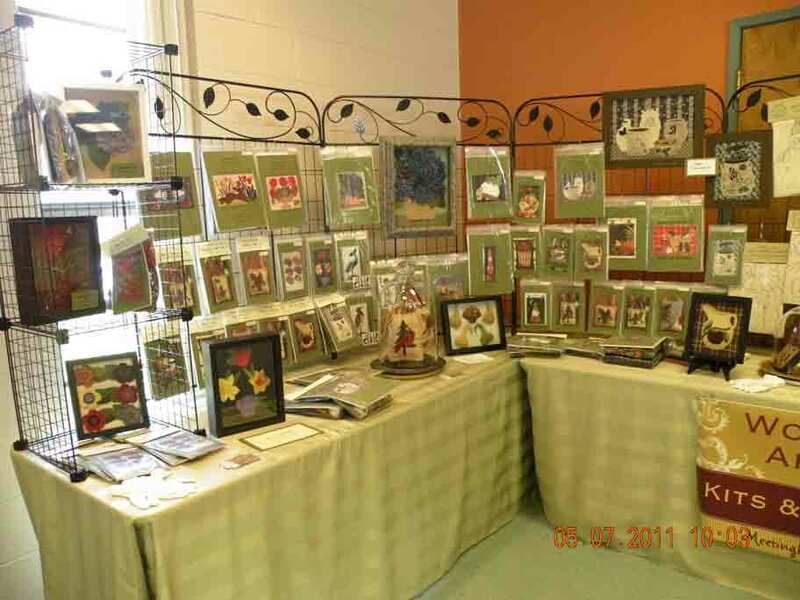 My work on display at Kindreds - "Autumn Splendor" and "Autumn's Perch" on the trunk, center front. 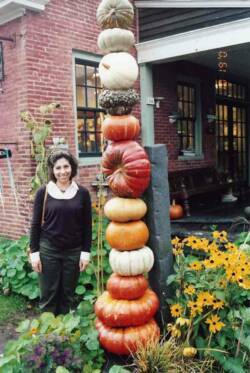 a pumpkin stack in Vermont, 2007. 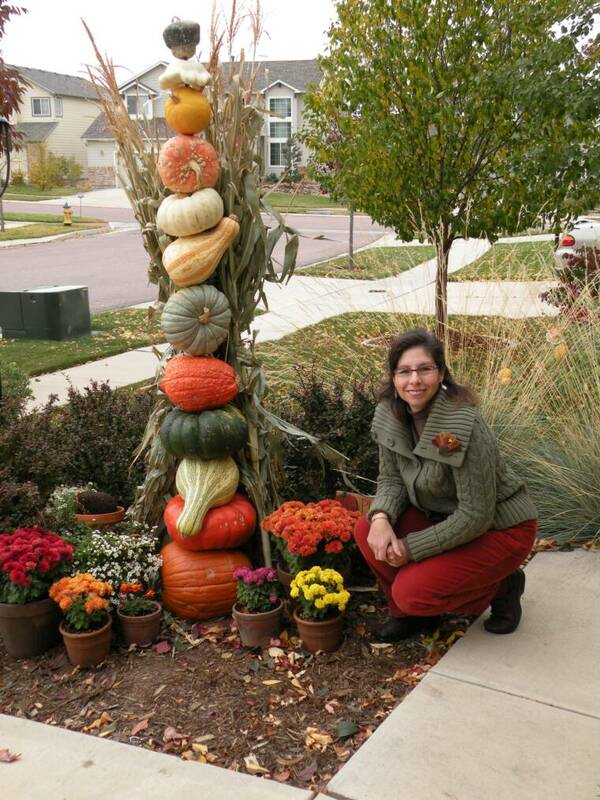 The pumpkin stack Kathy and Jerry built September 2009 in Colorado Springs! This is me at one of my favorite places, Sholan Farms Apple Orchard. 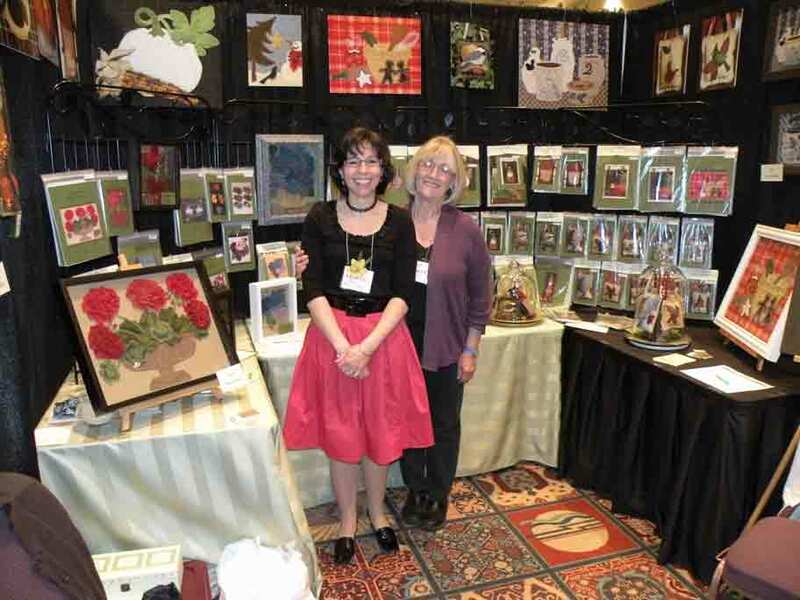 November Open House for "Needleworks by Holly Berry" in Colorado Springs for the last 3 years. in Pueblo, Colorado - April 2010. Camp Wool in Kennebunk, Maine. 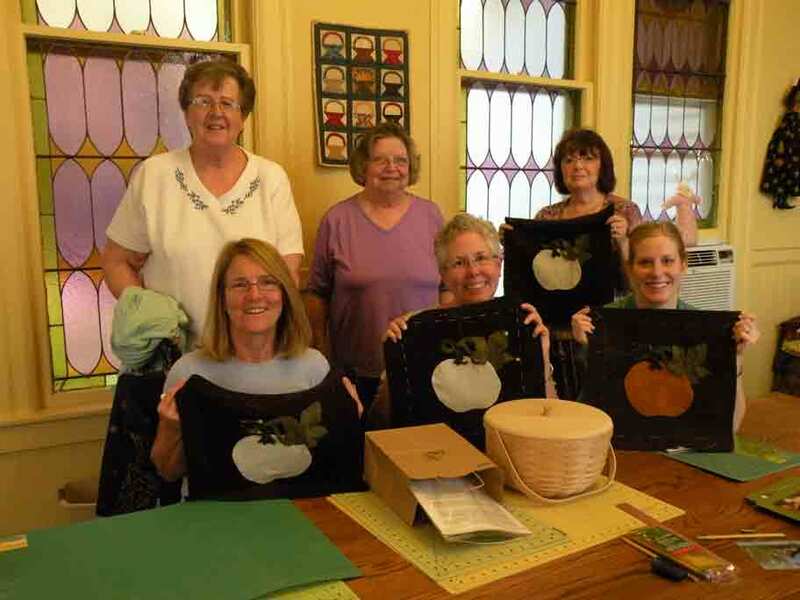 I taught a class to eight students on the "Glory Bee" pattern. LeAnn, the shop owner is in the lower left of the picture below. 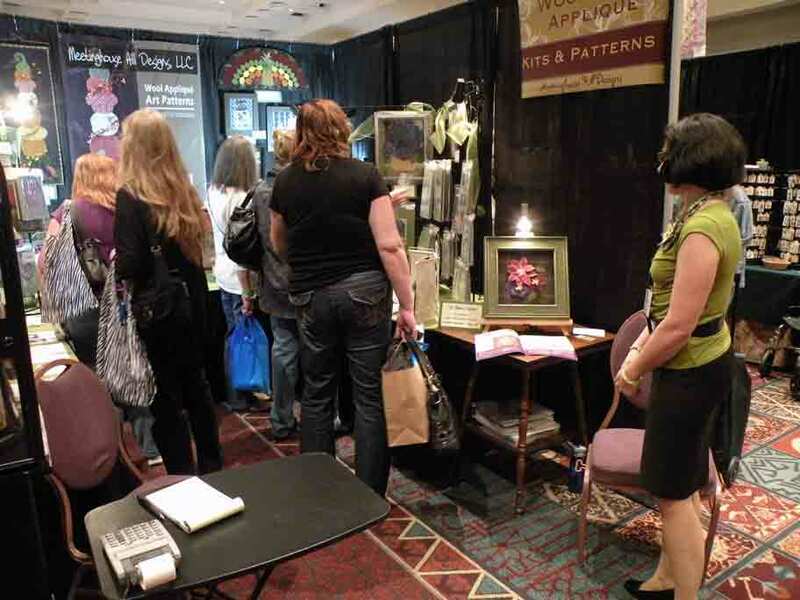 Pictures of my booth at the Denver Merchandise Mart in July 2010. 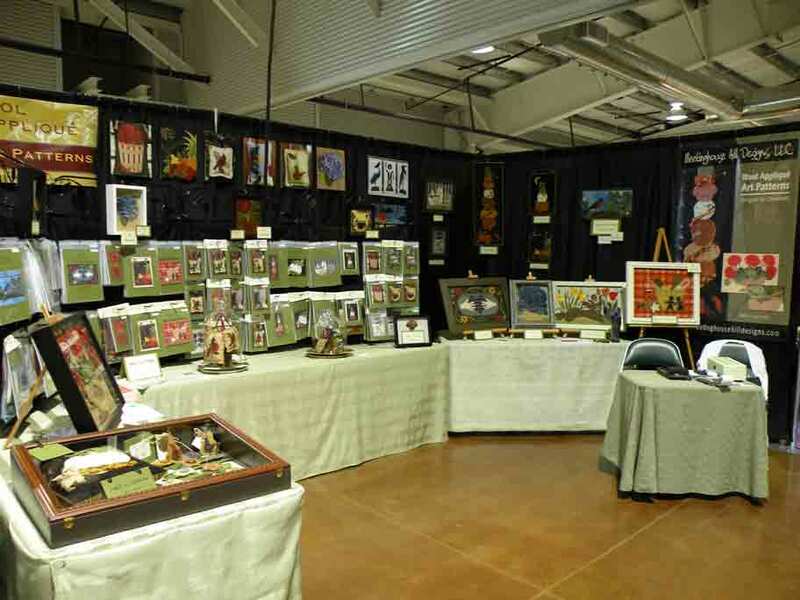 The picture below shows some of my original art pieces on display. Continue reading below for more background on Meetinghouse Hill Designs. Even before I sold patterns, a limited selection of my original artwork had been available for sale at Kindred's Antiques and Folk Art in Osterville, Massachusetts. 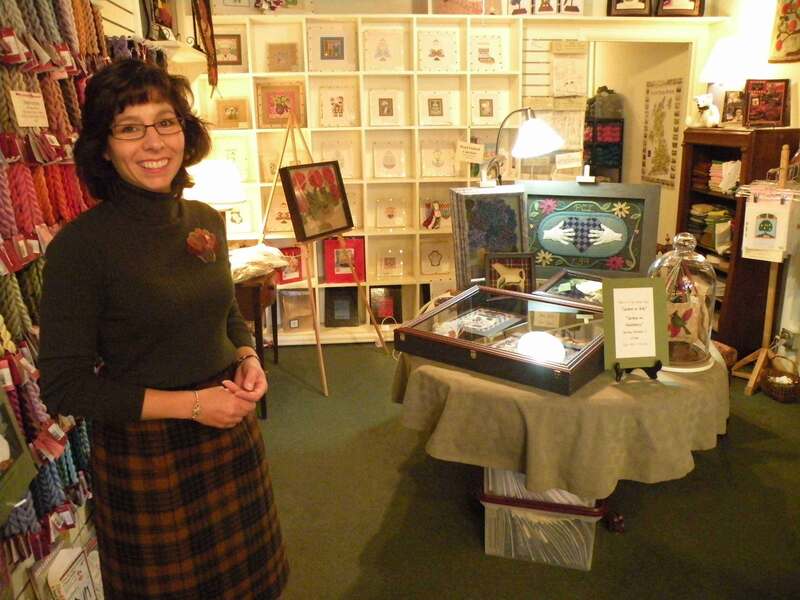 Sadly, Kindred's has closed their folk art gallery. They will be missed. 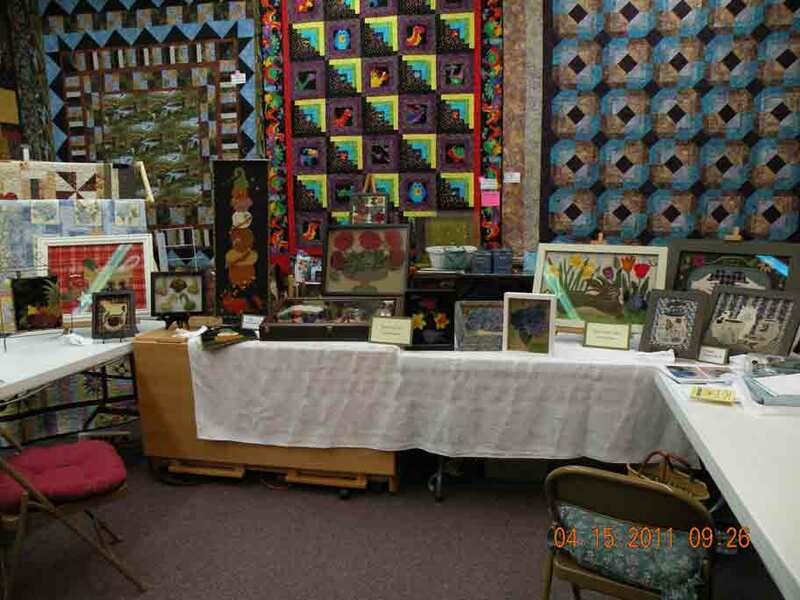 Quilt & Stitch Expo in Pueblo, CO - April 2011. 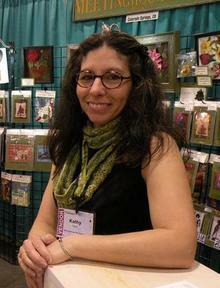 Kathy Read, Owner of "Needleworks by Holly Berry" in Colorado Springs. Denver Hook-In - May 2011. Kathy demonstrated some of her appliqué techniques. 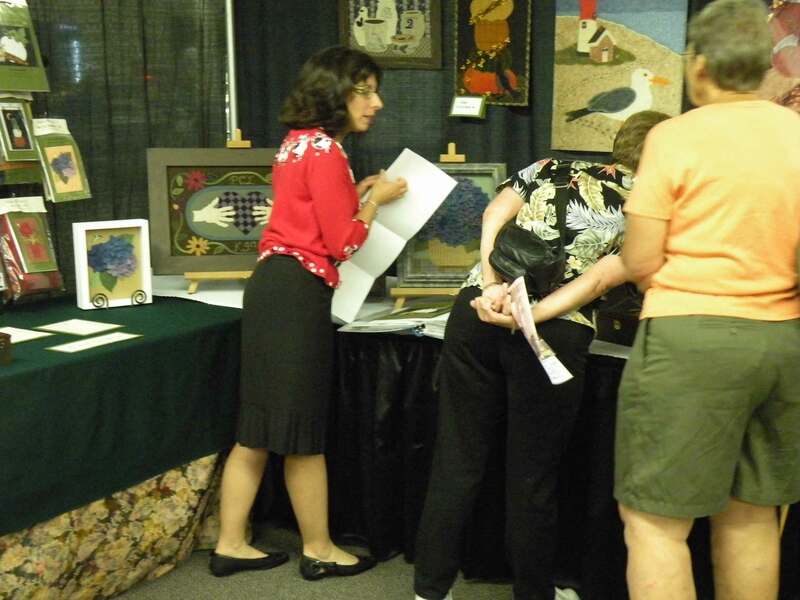 Trunk Show at "Ruth's Stitchery"
Rocky Mountain Quilt Festival in Loveland, CO - August 2011. Denver, CO - July 2011. 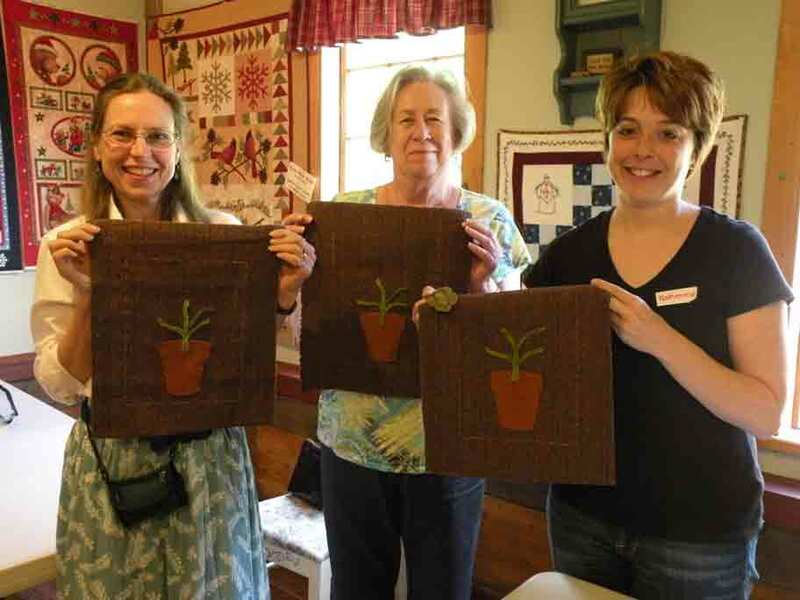 A few pictures from Kathy's classes in 2011 with satisified students and their projects. 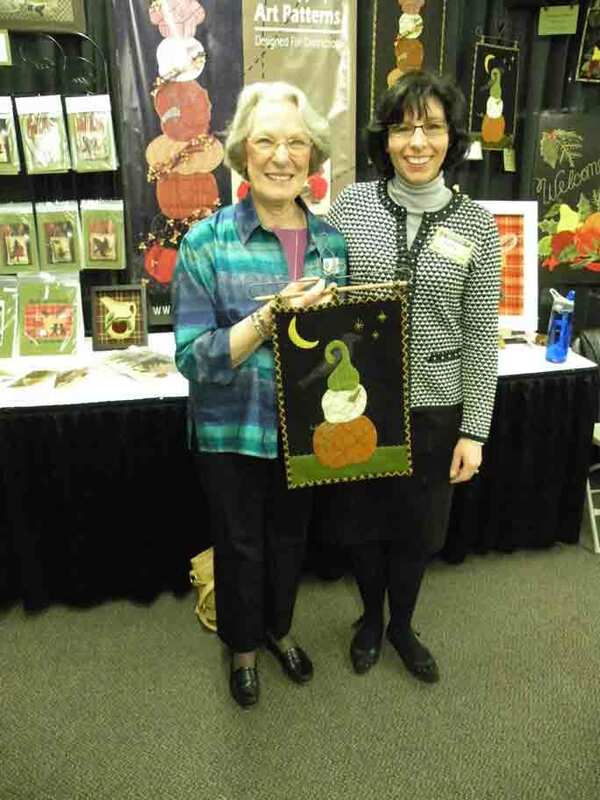 Left - Sandy came to one of our shows with her finished piece to show off! Right - The girls from "Glory Bee!" 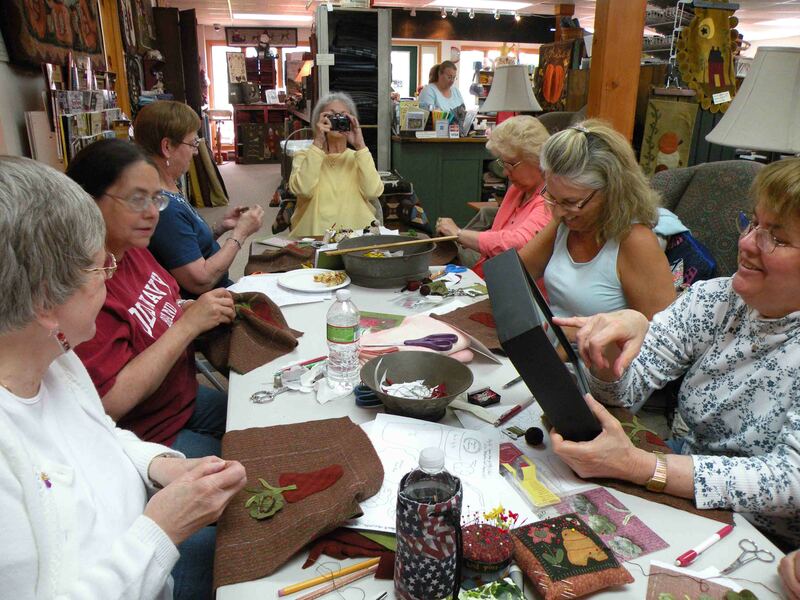 class at "The Quilted Crow" in Massachusetts. 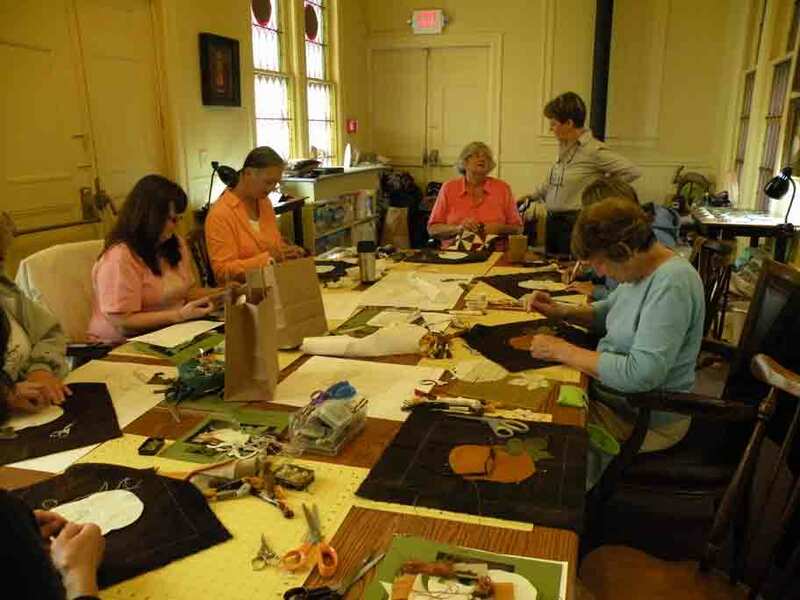 "a-MAIZE-ing il-LUMINA-tion" classes at "Meeting House Fabric and Trim" in Massachusetts. We LOVE to see what you have done with our patterns! 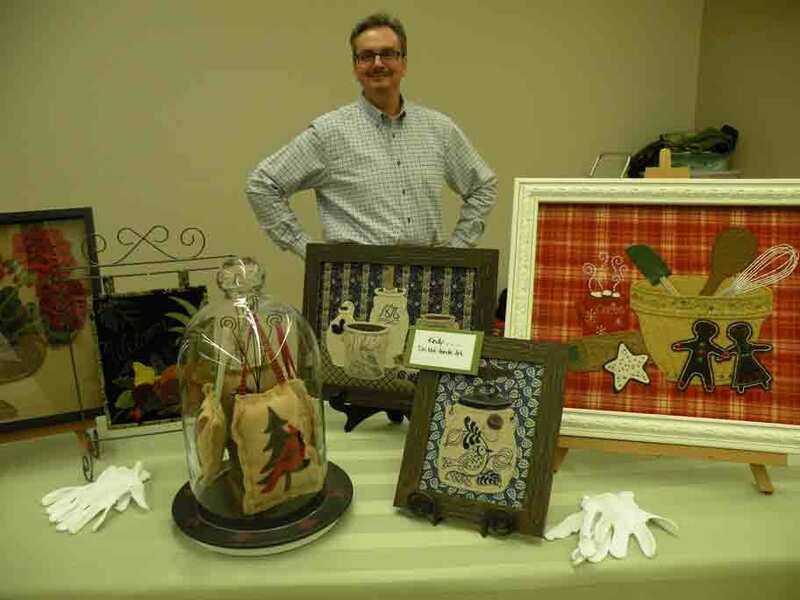 "The Stories Behind the Art" presentation at Colorado Springs Evening Quilt Guild - proud husband and business partner, Jerry! 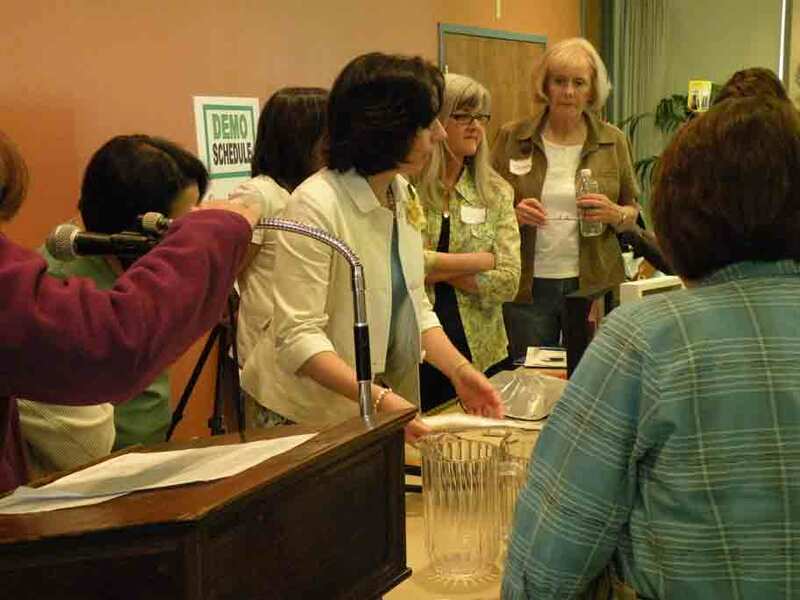 Presentation at Colorado Springs Embroidery Guild. Meet Karen and her mom, Pat! 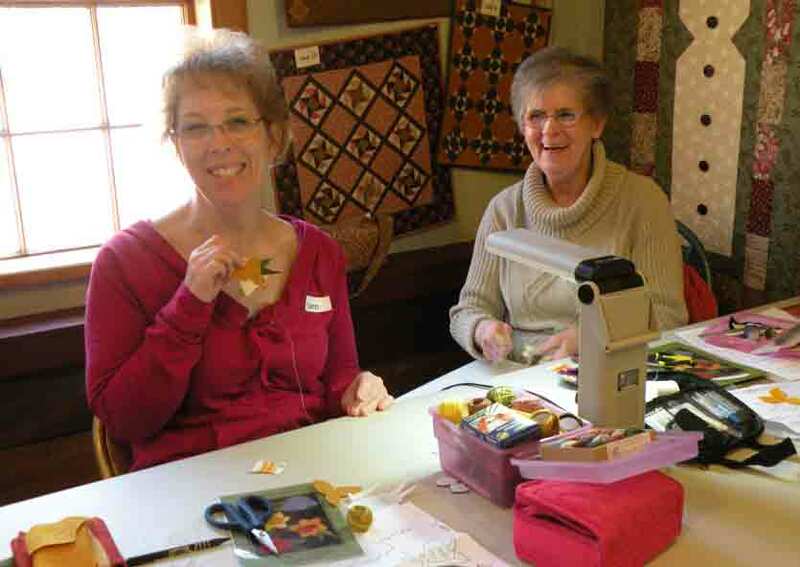 They were students in my class, making daffodil and tulip flower pins to welcome spring. 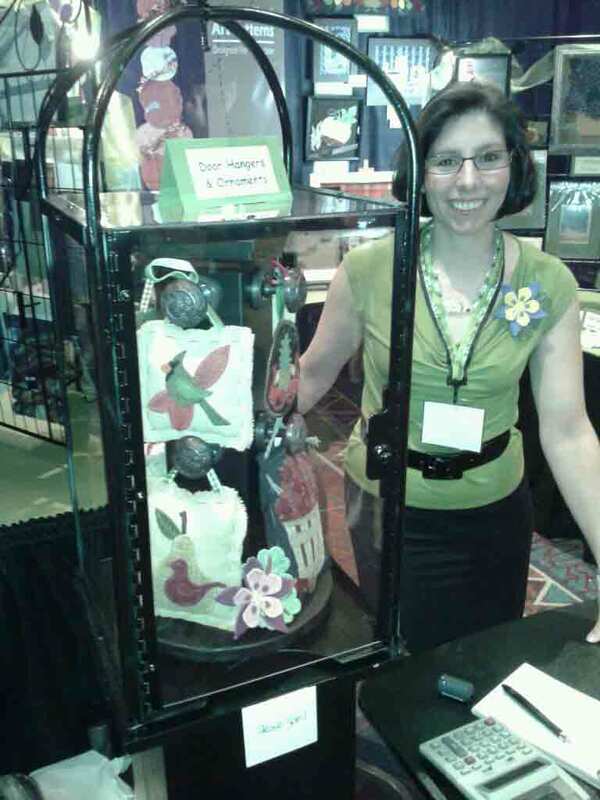 This was our third year to vend at this show. It was the FIRST show Jerry and I ever did, back in April 2010, and so it has a special place in our hearts! Introducing... the display that Jerry built! My husband is pretty amazing - he took an eyeglass display case and turned it into the coolest "door hanger" display for me! We will introduce this pattern to the general market at Spring Quilt Market! 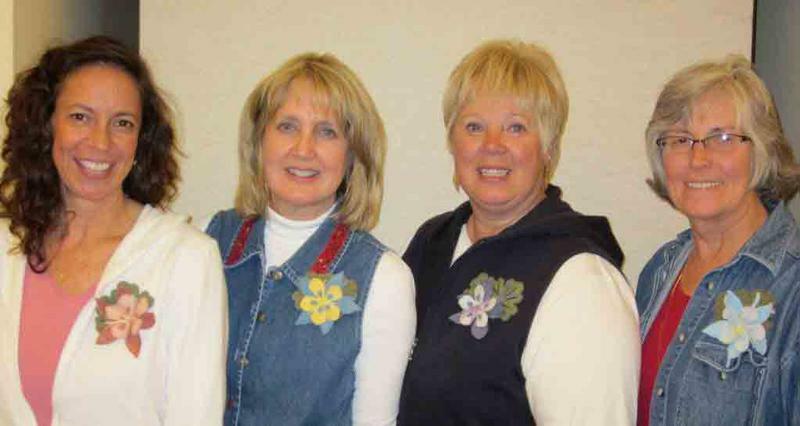 Happy Colorado Gals with Their Columbine Pins! 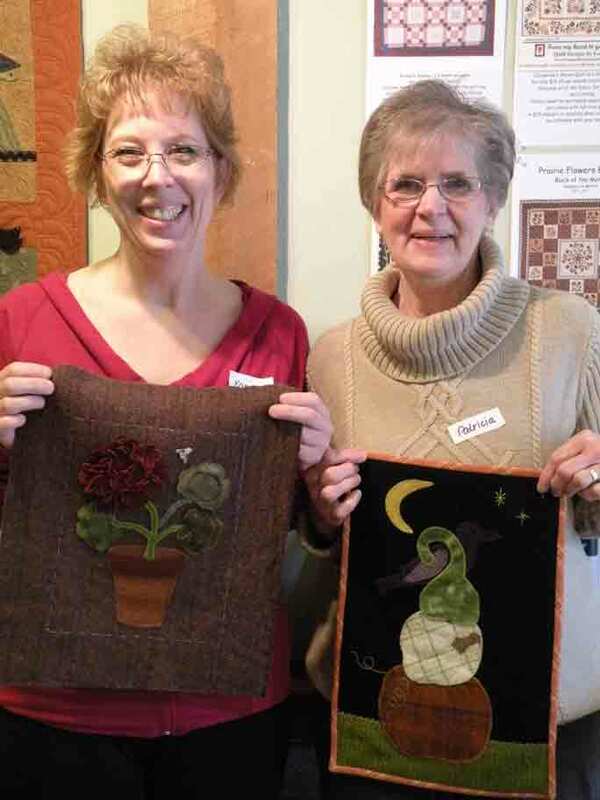 Karen graciously brought her two completed projects to show off - and they were awesome! Interested in being added to our e-mail list for notification of classes. WOW! There has been so much new since market in 2012!... 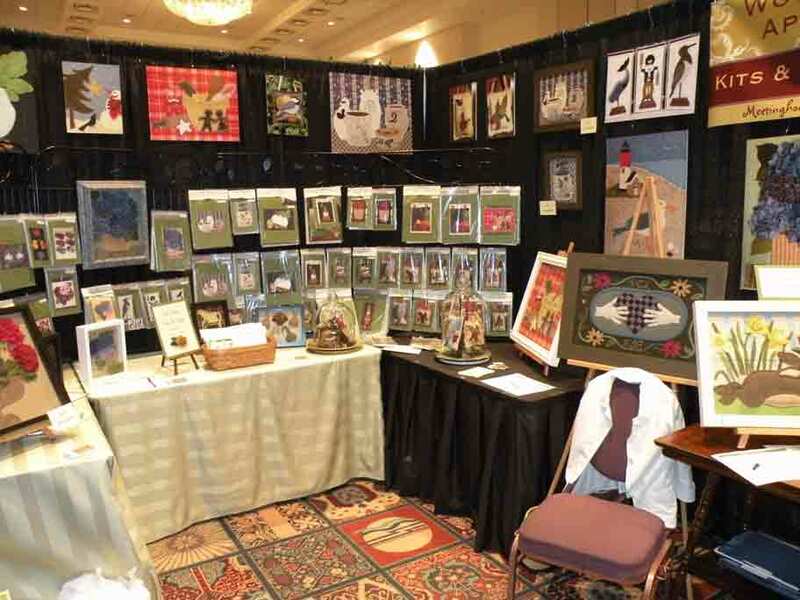 the World Quilt Show in New Hampshire, AQS's Des Moines Quilt Show, Colorado's Quilt-a-Fair, teaching in Maine and Massachusetts... and then there have been many new shows and hook-ins in 2013 like AQS's Paducah Quilt Show, The Vermont Quilt Festival and the Denver Hook In! So many pictures need posting... thank you for your patience with us as we grow!!! Visit our Facebook page for more. 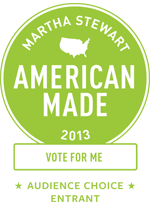 Thanks to everyone who voted for us in the Martha Stewart "American Made" competition! Although we did not win, we are proud to have been a nominee, and more so, very honored that so many of you supported and cheered us on! We are blessed by this! 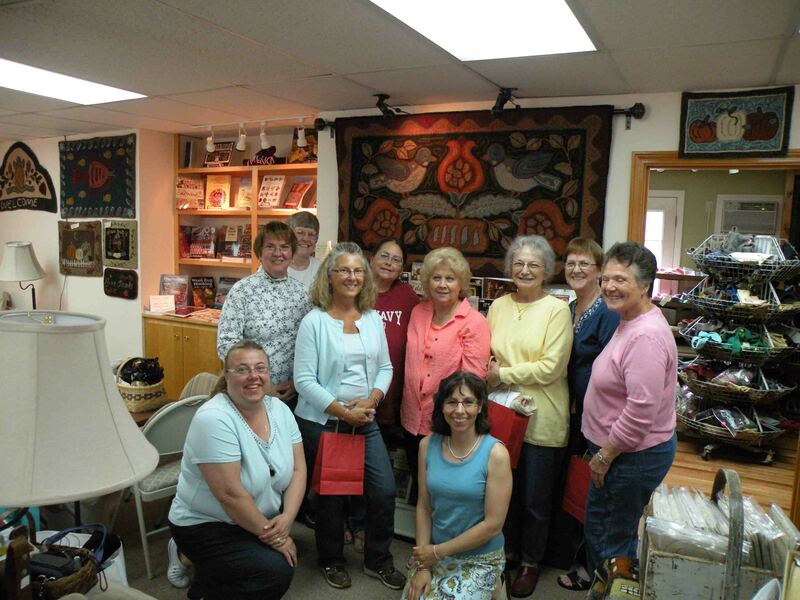 Rug Hooking Magazine Celebrated 25 Years! 3-dimensional dogwood blossoms to celebrate Spring! We are proud to share with you a story written about our pattern company in the Colorado Springs' Gazette on March 1st, 2014. To access the article, once at the link, click on the tabs for "Life", then "Home and Garden" and you will find it archived there! they put in the newspaper article. 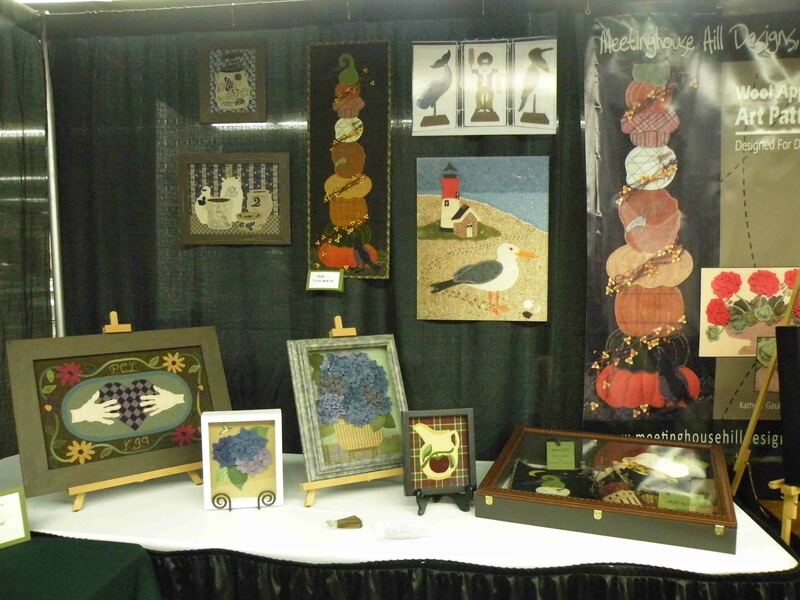 Vermont Quilt Festival 2014 - pictures from the booth and my "demo" table! 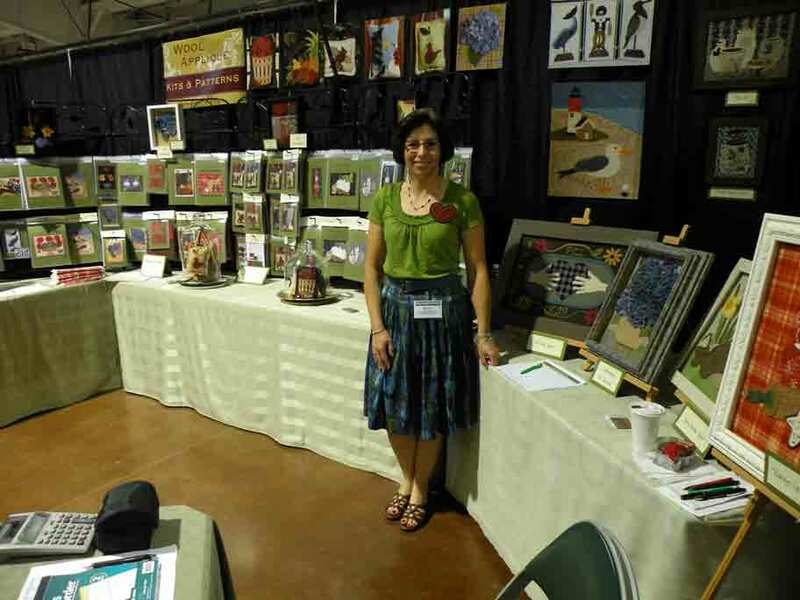 I was showcasing new rug hooking designs and how to create dimensional Indian corn and flowers. Thanks to everyone who viewed our profile for the Martha Stewart American Made Awards in 2014... and especially for those of you who shared it on Facebook and Twitter. Although we were not selected as a finalist, we are very proud to have been in the race! You may read about this competition by clicking on the red badge. 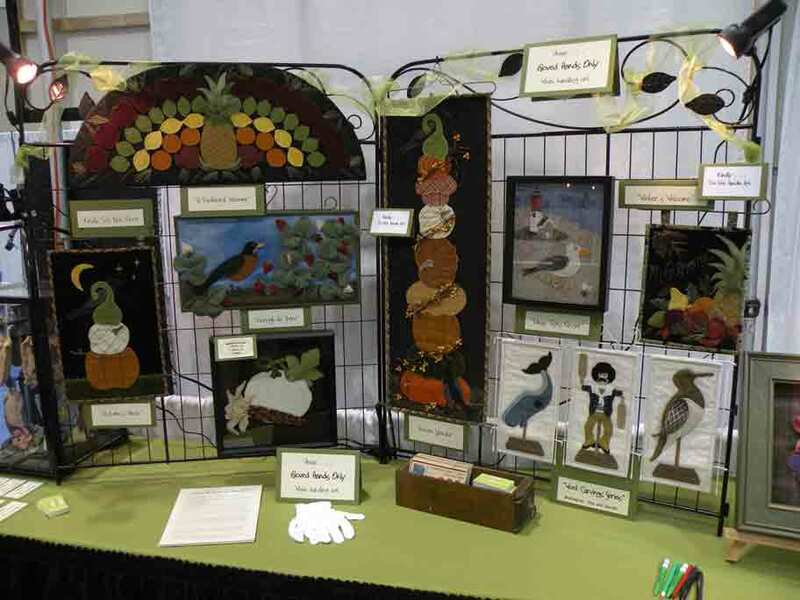 Photos from Vermont Quilt Festival 2015! My happy, and productive students... and my precious "booth dude" husband, Jerry!